​The VHC is a clinic (4215 Medical Parkway) that provides healthcare and pharmacy services to the under-served and uninsured in our community. If you have never volunteered at the VHC and are interested in learning more about their services you can reach out to our VHC Liaison, Amanda Stallings, at [email protected] . The available dates for January are Thursday 1/18 @ 7:00pm and Monday 1/29 @ 7:00pm. Thursday 1/18 is an acute care, walk-in clinic. Monday 1/29 is the weekly Chronic Disease Management clinic. Each night will have different and unique patient populations. Please consider volunteering your time if you are available and interested. This is a very rewarding opportunity for you to give back to your profession and community. Please respond directly to Amanda Stallings at [email protected] if you are interested in volunteering for either of these dates. YCF seeks to inform High School students about potential career paths by facilitating conversations between students and professionals from a variety of fields. We need several volunteers to talk to high school students about entering a career in pharmacy. Please respond directly to Kathryn Merkel ([email protected]) if interested in participating in this event. "A student-run initiative at the UT College of Pharmacy, gives UT pharmacy students the experience of screening underserved patient populations. Our mission is to "to provide quality health screening and health education services to underserved citizens of Texas, provide a means for student pharmacists to enhance their patient interaction and clinical skills, promote interdisciplinary collaboration, and advance the profession of pharmacy." Students from all pharmacy organizations and all UT campuses coordinate screenings for blood pressure, blood glucose, cholesterol, waist circumference, height, weight, and HbA1c. In the 2016-2017 academic year, 1,217 patients in Austin, San Antonio, El Paso and the Rio Grande Valley were screened. Referrals to area primary-care providers were made and patients were equipped with educational resources for improving their health. In order to continue the Project Collaborate mission, we are in need of pharmacist preceptors to volunteer at screening events throughout the coming semesters. Preceptors are needed for events in the following areas: Austin, San Antonio, El Paso, and The Rio Grande Valley. At Project Collaborate health screenings, pharmacist preceptors interact with patients, answer questions from students and patients, counsel patients on medication use and healthy lifestyle habits, and oversee student volunteers as they complete health testing, educate, and counsel patients. Pharmacists and students also work together with patients to develop individualized action plans, to be used as a tool for patients to reach their health goals. If you are able to help us with this important work, please send an email to [email protected] with the following information: your name, phone number, email and location of practice. Please know that preceptors are required to be recognized by the Texas State Board of Pharmacy. Lending your expertise to Project Collaborate will allow this program to grow and serve a wider scope of patients in Austin, San Antonio, El Paso, The Rio Grande Valley and in the surrounding areas. ​I'm excited to announce our upcoming events to kick-start our local chapter challenge! We are currently in the lead for NEW member amongst all local TSHP chapters with 61 new members!! From now until January 2018 we are competing with all the TSHP local chapters to increase our membership. We are starting with 199 points and our goal is 30 new members!! More prizes will be awarded on the state level!! 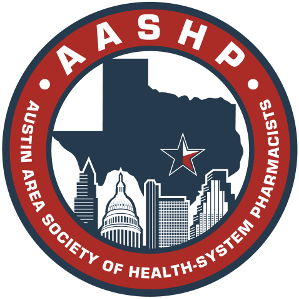 Deadline for drawing for AASHP Annual Seminar is October 1. Deadline for drawing for TSHP Annual Seminar is January 31. Join or renew on the TSHP website! Along with meetings and socials, there are many ways to get involved.